In a post-apocalyptic future all of humanity has been destroyed by machines. 9 awakes to find himself alone in a world destroyed by the vicious machines. By chance, 9 encounters eight other beings like himself and pushes them to fight instead of hiding in fear from the dreaded machines. As the group of rag dolls set out to understand the machines, they also learn they potentially hold the key to all of humanity. "9" is the best non-Disney animated film in years! Shane Acker's deserves a ton of credit bringing such a powerful story to mainstream audiences, one that doesn't rely on cheap jokes or humor to tell a enjoyable and captivating family film. "9" was originally an 11 minute animated short that was nominated for Best Animated Short by the Academy in 2006. The feature length film took the original story and expanded it into a 79 minute film that is from opening to closing stunning. The animation in "9" is breath-taking. It is absolutely incredible. It is richly layered and almost feels 3D during some of the more larger settings in the post-apocalyptic tale. All 9 of the rag dolls are intricately designed, with each one of them having it's own individual personality. One aspect to the animation that was a home run was the rag dolls eyes. People have always said that eyes are the window to the soul and here in Shane Acker's "9" that saying is displayed in commanding fashion. With 9 different characters there is a lot of individuality to discover within the different personalities, but Acker's does a fabulous job of weaving all of their personalities together into one. All of the characters have instant charm and the viewer quickly finds themselves becoming wrapped up into their plight. A lot of this can be attributed to the stellar voice cast, however the animators deserve a ton of credit for bringing to life these post-apocalyptic rag dolls. As for the voice cast Christopher Plummer, John C. Riley and Crispin Glover really stand out, but the entire cast is dynamic in their roles. Plummer plays #1 and his voice instantly demands attention while being utilized. #1 is the eldest of the group, while also the most reserved and he is a perfect representation of resistance to change. John C. Riley voicing #5 and Elijah Wood voicing #9 are the forces that drive and inspire change within the group and both actors do a remarkable job in their voice performances. Wood carries the film, but he is joined with such a talented group of voice actors around him that watching "9" is a delight while also being a thoughtful and compelling event. The imagery that is used to create the world of the machines in "9" definitely feels borrowed from pop culture and history, however the overall tone is a vivid depiction of an alternate reality reminiscent of the World War II era. All of the back story which unfolds the rise of the machines was absolute. It was a vivid depiction of the propaganda that was used in the 1940's to create fear and the result on screen was daunting. Some may gripe that the imagery of the machines looked like a cross between Hal 9000 from 2001 and the Sentinels in The Matrix, but regardless of the similarities it was a look that totally worked for Acker's original story. In the end, I was entranced by all of the animation. Overall "9" represents a need for more meaningful animation. There are too many animated films like Madagascar that have no redeeming qualities whatsoever. "9" rather is an enjoyable film for the whole family that still hits home with an overall message. It is compelling and gives a interesting perspective on a concept that has been covered many times before. The story itself is simple enough that children can easily follow, while remaining structured enough to keep adults equally engaged. There is a wonderful motion to the film combining for a perfect amount of adventure and just the right amount of character development. 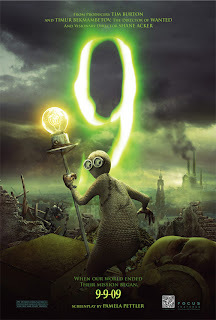 "9" is a must see for any fan of animation and one of the better animated films I've seen this year.